This month Kiki Yablon, KPA CTP, CPDT-KA, shares an unusual plan for how to keep your dog’s nails trimmed during the winter. A long time ago, when my ten-year-old pooch, Pigeon, was just under a year, I got greedy during a nail trim and cut her quick. She’s a fast learner, and that day what she learned was there was no way in hell she was going to let me come anywhere near her with those clippers again. Somewhere along the path to becoming a trainer, I decided to try to fix this. Using Laura VanArendonk Baugh’s excellent video as a guide, I broke down the nail-trim process into small, achievable steps, with extremely moderate success. Whether due to my own skill level at the time or the severity of Pigeon’s aversion to the clippers, it took many sessions over several months just to finally be able to clip a tiny bit off one or two nails. Pigeon files her own nails and is reinforced with a click and a treat. Teaching a dog from the get-go to accept nail trimming, as my colleague Laura Monaco Torelli has done with her Santino, is clearly the way to go. Changing a dog’s opinion about something that has already hurt or scared them can also be done, but it’s not always easy. Fortunately, it’s also not always necessary. Pigeon wasn’t going to encounter nail clippers just walking down the street, and if we could find another way to get the job done, she’d never need to see another pair. You might think that a dog who feared the clippers would doubly freak out about a power tool. But it was much easier to teach Pigeon to let her nails be sanded with a Dremel than it was to get her to accept clipping. She had no prior experience with the tool, and I took care to introduce it in small steps, using a combination of classical conditioning and positive reinforcement. The first time I presented the Dremel, I marked Pigeon for looking at it (using a clicker) and reinforced with peanut butter. Then I had her touch it with her nose. Soon she was heading toward the tool as soon as it was pulled out of storage. Next, I moved it away from her and turned it on, and as long as it was running, she got to eat peanut butter. When it stopped, so did the peanut butter. As she began to perk up at the sound, I moved it gradually closer. Thanks to our prior work with nail trimming, she was comfortable with me holding and manipulating her feet, so I picked up her feet while running a Dremel nearby. Next I let her feel the vibrations briefly through the handle, then got her comfortable with having a stationary sanding head touched to her nails. Finally, we could put it all together: holding her paws, bringing a moving sander toward them, and holding it to her nails for up to five seconds at a go. Each of these steps was paired generously with peanut butter as well. After about a month of inconsistent practice, my husband and I were able to Dremel all her front nails in a single sitting. When I pick up the tool, Pigeon runs to the couch where we do it. I do the sanding, and my husband mans the PB. During the process, Pigeon can take her paw out of my hand or leave the couch at any time, but rarely chooses to do so. Still, because it’s a two-person operation and involves remembering to charge a battery, we tend to fall off schedule. And in the winter, with less walking and more snow, the dog’s nails tend to get longer faster. So during the recent holiday season, I tried out yet another alternative method: teaching Pigeon to file her own nails. It’s my favorite so far. Here’s video of the results with Pigeon after just a couple sessions. Some notes: Pigeon had some basic skills that contributed to the speed with which she learned this. She understood what a click meant (that whatever she just did had earned her a treat), and she had been reinforced in the past for targeting items with both her paws. I used her paw cues to get her feet on the board, and then clicked and treated for even the slightest accidental scratch. Many dogs enjoy scratching, so if their paws are on it long enough you’re bound to get the behavior. I wanted to keep her nails fairly even on both front paws, so when she could scratch with either paw, I would ask her to do one paw, then withhold the click. She’d try the other, and then I’d click and treat. One scratch with each paw is the criteria you’ll see her starting to understand in the video. Pigeon’s rear nails stay short with no help from us, but that may change as she gets older and less mobile. 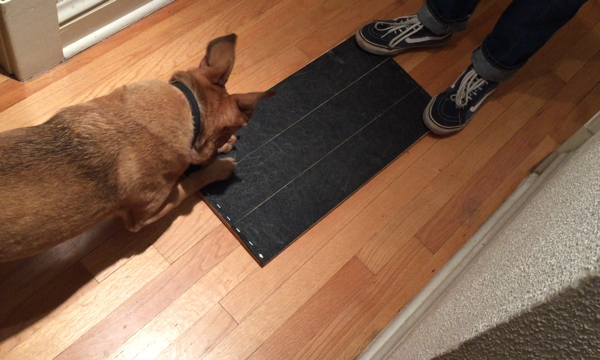 Chong suggests capturing (observing, marking, and reinforcing) the back-foot-kicking many dogs do after pooping and putting it on cue, then transferring that to the board. That may be need to be our next nail-related project.